Harvests in late spring/early summer - stores into late fall/early winter. Order now for shipping in late summer/early fall. Shilla is a very unusual garlic and surprising in several ways. First, the bulb wrappers are very white background-most Asiatics and Turbans seem to have a lot of purple coloration. Secondly, there is a strong tendency for these weakly bolting hardnecks to produce a scape and the bulbil capsule at the top of the scape has a very definite turban shape to it. The clove covers are brownish-purple. Shilla have a very strong garlicky flavor with a moderate heat. In addition to a nice garlickiness they have a distinct undertone to them that strongly reminds of Dijon must and, rather similar to Rose du Lautrec, a Creole garlic from the South of France. They have a strong aftertaste that sticks around for a while. While they are certainly not the strongest garlic I have ever tasted, their Dijon-like flavor makes them very unusual. Asiatic and Turban garlics are always the first garlics we harvest each year as they mature weeks before any of the others. 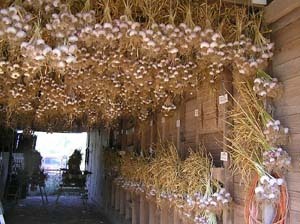 They should be grown in conjunction with longer storing garlics like Porcelains or Silverskins since they harvest a month or two before them and provide garlic at a time of year when good garlic is very hard to find. Another surprise is the bulbs, which are much larger than you would think as you look at the size of their foliage. When you see them growing in the garden among other types of garlic, their leaves are not nearly as large as the others and you begin to think they aren't going to form very big bulbs, but the bulbs turn out to be larger than you might think. They store clean but they don't store as long as most other garlics as they seem to want to get back into the ground earlier in the fall since they mature so early in the spring. Shilla garlics average about eight big fat cloves per bulb in a rather circular configuration around a central core with no tiny interior cloves.